There are few restrictions on photographing wildlife if you are not near enough to cause them harm, for example when taking photographs from some way off with a telephoto lens or when photographing from a hide that has been built for the purpose, and with many species our own hides, camouflage or just becoming accepted by them. In the rare situation that we want to get closer then there are some restrictions that apply. One of the major problems of course is that you can disturb a protected species of animal or bird without intending to and as it goes off in a hurry, not know what it was that you disturbed. Wildlife is of course resilient, few if any are likely to abandon their nests, eggs or young just because they have been disturbed, and in many cases it will only be minutes before they are back. Many of us while perhaps being able to recognise some of the more common wildlife are not completely up on all varieties in all stages of growth at all periods of the year, and frequently therefore we will photograph something and later identify what it is. It would be unlikely that this would present problems, the area that many will break the rules is in ‘gardening’ around a nest or animals home area, so as to get a better view. While some may see no harm in cutting back a little undergrowth or trimming away a few twigs, the risk is that it is not only us who can see in, but predators as well. In the garden, the local cats are a far greater risk to wildlife than photographers, and in more wild places, it is birds of prey and other predators, including those like Mink that should not be there. None of us would wish to harm the subjects we want to photograph, and those of us who have lived in the countryside and spent time with wildlife know that most species will become tolerant to people and loose their fear, over a period, especially if you are providing part of their food. 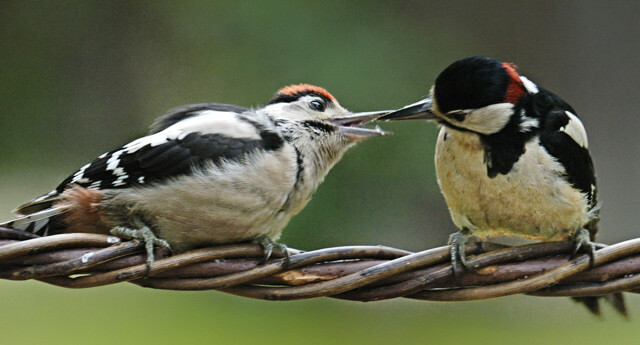 For example Greater Spotted Woodpeckers will fly away from a feeding station, when they first see you, but if you are quiet, make no sudden movements and persist they will not only allow you to photograph when close up but eventually bring their young and feed them within a few feet of you. Most other garden birds and game birds are the same, and once you have many birds around you others will be attracted that are not feeding from your food, but feel confident to come and nest and welcome you nearby. Badgers will initially become a statue and then skulk off, but before long you can be near to them without causing them distress, foxes will stop to look to see what you are doing and even some birds of prey will land on the window sills to look at their reflections and at least while you are inside stop to study you, even if not stopping for long enough for you to get your camera. Many who live in more isolated country locations have deer in their gardens and in a number of places throughout Britain wild horses will be encountered that are not far from tame. Venturing near seabird colonies you will find you are at far greater risk from birds who can bomb with considerable accuracy than they are from you. Generally if wildlife don’t like being near you they are expert at disappearing, and providing that you do not damage their nests or other homes, or young, as soon as you have passed they will continue as before. My own experience with birds and other wildlife, that had become used to me being around, was that they came in increasing numbers because we had feeding stations and when some of the braver ones took the risk and were seen to be safe, others gained confidence. I have photographed many species close up and in activities like feeding young and in the breeding process, however as they were happy to come and do this near me it may be different to if I was on their territory. I found that generally they were happier when I was visible than using a hide, didn’t generally like me wearing camouflage clothing, and that you never walk towards any creature but use a zigzag route slowly getting closer to them. Also while near Puffins, they were not at all concerned about me, and in some ways me being there provided some protection for them from gulls trying to steal their sand eels they had brought back for their young. The young however were in burrows away from me and the gulls. Birds and other wildlife recognise safe places and people, will feed from or near those they can trust and are far brighter than many give credit. Game birds for example knew when guns went off on nearby farmland to stay within our garden. The largest number of casualties did not come about from those shooting but from traffic. Compared to the number of birds killed each year by traffic, pollution and predators I do not think even the worst photographers or birders are any significant risk. So why you may ask are we even writing this article, well living in a country where too many laws exist, you will not be surprised to find that we have restrictions. An intelligent person could easily create a simple law in relation to all wildlife, it would say something like, ‘don’t intentionally do harm to wildlife, nests, or young, or cause them distress.’ But you won’t be surprised to find it's not that simple. Guess what you need licences for loads of things to do with some species, and what’s more only a few are issued, so you are unlikely to get one, unless your are a major broadcaster or a university wanting to run a research project. Photographing roosting bats, looking with a torch for pond life, newts in particular, photographing nests, all need licences so although you will have seen it done many times on TV, you can’t legally do it. Of course as long as you can do it at a reasonable distance and the wildlife is not disturbed and the distance will depend upon the species, then this does not apply to you. Generally you are the only one who can judge if you are too close and causing distress, and if in any doubt give it a little more room until it becomes familiar with you. Some of these restrictions apply to a set list of rarer birds, but the list is quite long, and as they are generally rarer it is unlikely that you will immediately recognise them. With around 3 million adults actively involved in bird watching in the UK, it is felt necessary to have some protection for the birds to allow them to survive our interest. There is a legal restriction without a licence to disturb any nests, and the birds while nest building with eggs or looking after young. There are also restrictions that say you should not disturb nests or cut garden hedges or do anything else that might damage bird nests, and this the RSPB defines says ‘It is an offence under Section 1 of the Wildlife and Countryside Act of 1981 to intentionally take, damage or destroy the nest of any wild bird while it is in use or being built. It will be an intentional act, for example, if you or your neighbour know there is an active nest in the hedge and still cut the hedge, damaging or destroying the nest in the process. Most who break this rule are more likely to be gardeners than photographers. Wild birds protected by the Wildlife and Countryside Act of 1981, are basically all birds, except a few classed as pests, with the exception of game birds like partridges, and pheasants, these have some protection in the closed season in the Game Acts. As with many acts there are long schedules, and in this case it lists what bird types are protected and those that are not, as well as those that have protection for certain parts of the year. Can be shot at some times, can be kept in captivity with a licence and the like. A government minister can add or remove birds from the schedules. Licences to do more, including possibly disturbing birds by photography can be in theory obtained from Natural England (formally English Nature) in England, Scottish Natural Heritage in Scotland and the Countryside Council for Wales in Wales. While nearly all birds have some protection some others have greater protection and are listed requiring special licences if your activities may disturb them, and it should be read that you should not visit the nest of birds on the first schedule, without a licence that you are extremely unlikely to get. Bats are protected just about everywhere except in the living part of homes, and this means they should not have their entrance or exit blocked, or be disturbed. It is also an offence to intentionally or recklessly disturb a dolphin, whale (cetacean) or basking shark. Other protection covers badgers, deer, seals and cataceans. If you wanted to photograph these animals or most of the birds in a way that might disturb them, or any on the first schedule near or at a nest site, then the quota is set at about 1% of the number in the UK, but with birds upsetting one may disturb a colony so the numbers are far smaller than you night expect. There is, as far as I can see, no cost in obtaining a licence, however this is not causing them a great loss of revenue, as you are not likely to get a licence anyway. So what do you do if you have come across a nest by accident, not knowing what it was, photographed it, and then discovered you had a rare find. Perhaps as you are a responsible person you will never tell anyone where you managed to photograph it, as you wouldn’t want anyone else to disturb the rare bird, there is little risk to you as without this information any action against you would be unlikely, particularly if you never disclose the country, place or date. Also as any damage done has already occurred there would be little point in perusing you. I am not suggesting in any way you try to work-around the rules, but it would be silly if you came across something by accident not to be able to use it. Do let's look at which birds we need a licence to photograph near a nest site. The number in brackets is the number of licences issued per year to take action that might disturb them and this includes all photography and filming. I think this is the number issued in England its not clear if the number includes those issued by the Scottish and Welsh agencies as well, or if they also have a quota. If there is no number then there are no licences issued at all for this species. As you have to complete a form and be selected in advance, you can't really come across one by accident and then get a licence to photograph it and as these are rarer birds or animals, this process is really a closed operation available to those who are part of larger organisations or who have already established a reputation for this type of photography and who will be favoured when the few licences are available. A particularly good and helpful guide produced by Scottish National Heritage www.snh.org.uk/pdfs/licences/PhotoCode.pdf - that I only became aware of after writing the article above. It gives quite lot of general advice as well. Disclaimer: We are not lawyers and therefore this article has been put together based on our understanding for looking at the various sources available and what we have read elsewhere, and talking to many people. Within this article there are links to various other websites that may be able to give you more help or at least allow you to work out whether you need more advice.